Hugh Jackman – he can’t go wrong can he. Can he?? Yeah. He can. You could look past his mullet haircut, which is an awesome way of identifying his role in this film. But he simply isn’t enough to turn this film away from the steaming pile it is. I’m also not sure if the reason I’m going to give this film a panning is because I’ve just seen Ex Machina, an alternate take on AI, providing very clever reasoning, debate and logic with stylish and witty dialogue. Or if Chappie genuinely is a bad film. I think it’s the latter. The entire movie becomes an over acted, sappy and clichéd romp across South Africa’s torn up crime estates. 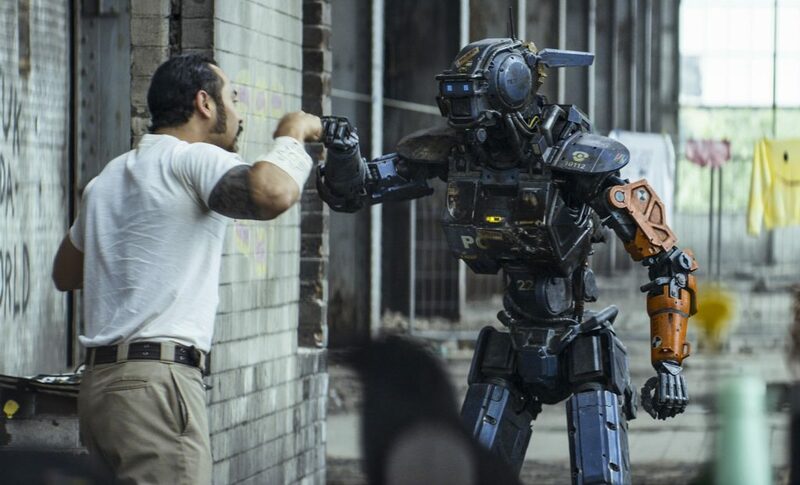 With the region patrolled by a handful of ‘police robot scouts’, Neill Blomkamp is in his element as we provide him with some interesting subject matter and a gritty backdrop to perform his magic as he did so wonderfully in District 9. The gangsters are so badly made up, they would look more at place on a parody blog youtube video than a feature movie. Then to have the robot ‘become’ a gangster, resplendent with chains and spray tattoos, well that was pushing it too far. But despite some mesmerising special effects (I genuinely struggle even today to ascertain whether the robots are real or CGI, that’s how good the fx are), the story is so poorly written and acted out, I can only assume Neill had the concept worked out and rushed something out to glue it all together. It’s cringe worthy at times and even if we were to suspend our disbelief for a moment, the premise is so far-fetched and badly coordinated, I struggled to make it to the end of the movie. Hugh Jackman does his best with some terrible material and Dev Patel just seems a little out of his depth (“I’m your creator, treat me with respect!”). After District 9 and Elysium, Blomkamp really needs to make sure Alien 5 is on point as I have a lot of my own sanity invested in him. Don’t let me down son.